The Yahoo! Directory was once my favourite destination for all my links. It has now closed. No other Usenet search engine has such a long archive or threaded results. finger was what people used for self-expression before the Web and personal home pages. You would put your "home page" in your ".plan" file, which finger would display when called. There used to be servers that could interpret your .plan file as HTML. I'm not into real-time chatting any more (I used to be when I was first on the Internet), but the idea of 3-D visual worlds that you can wander round is interesting. As long as I don't have to talk to anyone. Second Life has a 3-D Dublin. TCD researchers (and here) have built a 3-D Dublin. Wilton populated by the family of the 10th Earl. Eighteenth century Dublin, where you can wander and turn corners at will. Over the next century, more and more 3-D models of real worlds, present and historic, will come onto the Web, and the whitespace between them will diminish, so that eventually you can place yourself in College Green, Dublin, in 1790, and just start walking. Head out of town, into the countryside, which will all exist in simulation, and just keep on going. This international, decentralised, 3-D world, something that could never have existed before the Web, could eventually become the unifying interface to the world's historical and geographical information. Google Earth is now allowing people design their own 3-D versions of real buildings, and Google will embed accurate designs in their 3-D map. So the 3-D world can be built in a distributed fashion by thousands of people. Next step - allow different time periods. 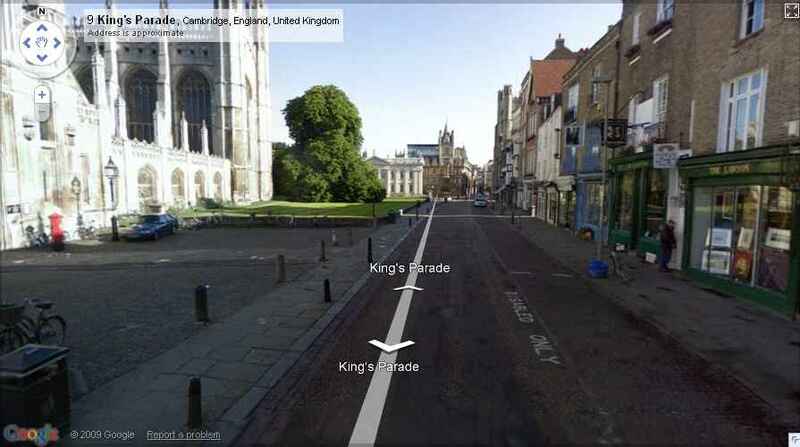 Google Street View of Cambridge. Beautiful. I dreamed of something like this for years before 2007. I can write a 6 line program in Shell to turn my desktop background into a dynamically-updating live view of Dublin. Ultimately one could imagine a continuous live video background, coming from anywhere in the world. Live video cameras could be put in completely inhospitable spots, like on the outside of trains or aeroplanes, underwater, or on the surface of Mars. You can use a layered jpg to implement inline live video. e.g. Dublin. World stats updating per second. Calculate Mean, Median, Mode of a list of numbers. To turn spelling highlighting off: Click icon with red wavy line. Microsoft TNEF email attachment format (winmail.dat) - email attachments that cannot be read if you don't use Microsoft! Online converters tend to have limited range of fonts. Wolfram|Alpha can be used to plot functions. Pick icon for transparent / not-transparent. Pop-up gives font, size, etc. Make a table with a background-image and then write text in the table. Do multiple small (e.g. A4) scans until you have covered the whole document with overlapping images. Just drag and drop the multiple small scans onto it. It figures out the overlaps automatically and creates one huge image. Can be tricky not to lose the transparency. Online editor Lunapic seems to work. Play inside IE browser and PrintScreen screen capture as normal. ClearType does not work with my eyes. It never has. It looks blurred to me. Control Panel - Performance - Visual Effects - Uncheck "Smooth edges of screen fonts"
Vertical lines: View - Show Symbol - Show Indent Guide. Change font with Ctrl-scrollwheel. It remembers. Features - Syntax highlighting for HTML and CSS. Clipbook libraries - see also Latex, C++, etc.